United Cardinal Bloggers’ Discussion: Michael Wacha or Carlos Martinez? For November 12, 2013, it was my turn to ask the question for the United Cardinal Bloggers’ Round Table Discussion. Question: Who do you believe has the brighter future, Michael Wacha or Carlos Martinez? You can use whatever criteria you choose for this answer; I just wanted to get a feel of where the rest of UCB stands on this topic. The pitcher who is least susceptible to injury has the brighter future. I don’t know enough about their mechanics and makeup to make that determination. Based on their ages, their 2013 performances at the big-league level, the quality of their pitches and the comments of their peers, their futures are equally bright. 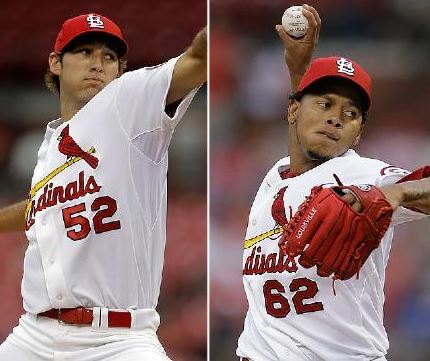 Given that both pitchers remain 100% healthy (wishful thinking), who has the brighter future, Michael Wacha or Carlos Martinez? Usually, this would be a question I’d be asking you. I’m not good on evaluating pitchers well, but I’ll certainly give it a shot. What Wacha showed in September and October just goes to show that he has ice water running through his veins and talent in that right arm. If he can continue to work on his curveball (and who better to work with than Wainwright), then I can see him becoming the ace of the staff once Wainwright retires, and the #2 until then. Martinez is still in the “raw talent” phase to me. He has a great, lively arm. He can throw fire at times. I think he might need just a little more development in order to get his stuff right to be a starter. In his 1 start against the Dodgers in August, he gave up 4 ER in 4.2 innings on 7 hits. He did throw each of his 4 pitches (fastball, sinker, slider, change), but the Dodgers got the best of him. In his relief appearances, I felt it was a toss-up on whether he would strike out the side or he’d give up a run or two. Looking at the game log, it was about every 3rd appearance that he would give up a run. He’d pitch great, pitch great, not pitch great. In the end, I would have to say that I think Martinez can be great with a little more refinement, but Wacha is great right now and will continue to get better. I don’t know what the future will hold, and so I may be wrong about it, but if I were asked right now to put money on who I think will have a better future, I’m placing all my money on Wacha. I’m not sure. They are both capable of being finalists year in and year out for Cy Young Awards. Martinez could easily be a guy that gets 200 wins or 300 saves depending on which route he goes. There’s a reason he draws comparisons to Pedro and it’s not for nothing. Before this season, I would have told you Carlos Martinez had a brighter future, and it’s not even close. After the season, I still believe Martinez’s future is brighter but Wacha has narrowed the gap, and its nothing to do with Martinez. Wacha is performing above expectations. His fastball is a little faster than at A&M, and his changeup is a little slower. I am going to disgree with something that Ben said. I am not sure how much better Wacha can get. As of today, Wacha is closer to his ceiling than Martinez, thus I am not sure where Wacha can go. As sick as C-Mart is now, he can get more consistent and that is scary. In 30 years after they are both long gone from the game of baseball, I believe Martinez will have had the better career. I think I’m going to swim with the stream here and say that Wacha is the better bet for 2014, Martinez for the long haul. I remember reading when Wacha was drafted that he was already close to his ceiling and would likely move rapidly due to that. Now, the evaluations have changed some given what Wacha has done, but I think that probably still holds. Both are likely to be above-average major league pitchers, which is a great thing to have on a staff, but I’m still probably leaning toward Martinez, assuming he can put it all together. I am inclined to say that Wacha will be the better prospect, for a few reasons that I’ve noticed already. #1) He’s exceeded his scouting report already, which projected him as (and I remember this clearly because I felt like throwing up) a “3 or 4, Jon Garland type”. With all due respects to Mr. Garland, he’s already blown past him. #2) He has shown the capacity to learn on the run. He had three separate genesis’ in 2013 alone, from lights out reliever to high potential, up and down rookie, to lights out starter, already. That takes a high IQ and short memory, which will do nothing but get sharper. #3) While he may be close to his roof already, he’s done so while still not completely unleashing what will be his “over the top” pitch (meaning what could boost him to elite in baseball status): the curveball. Within two years, when he completely comfortable with it, he’ll be showing more looks on the mound than any pitcher in St. Louis since Chris Carpenter‘s prime. Much like Adam Wainwright, he has taken the tools he has and made better on them than expected. Wainwright didn’t profile as being within the top 5 or so starters in baseball at any point in his career when he was rising through the system, but learned, mastered what he had and turned into one. I see that same type of package around Wacha, and for that reason alone, I think he’ll be the better product long-term. My thought is Wacha as well and, as I was trying to come up with my reasons why, I read what Matt had to say — and he said it much better and more thoroughly than I could. Not to say that Martinez won’t be great as well but, as several have already said, his talent is more raw and still in need of refinement. We saw such moments of brilliance, but he still needs more polish. But what two great talents — and what a great debate we are lucky enough to have. I’m no scouting expert, but the feeling I get is that Wacha is at or near his potential right now, while Martinez still has room to grow and improve. What’s scary to think about is what Wacha might do if he could develop a curve as good and consistent as say Adam Wainwright. Combine that with his fastball and devastating change and he would be unhittable. Martinez just needs to get more consistent with his pitches and location. He has better all around “stuff” than Wacha, but Wacha is more polished at this point. Thus, in the near future, say the next year or two, Wacha will probably be better, but overall, I think Martinez will have the better career. With these two wicked young talents capable of all the pitching awards, choosing between them is like debating between a pair of sharp shooters. Wacha and Martinez are each enormously talented and capable of greatness, but if I had to go with one for the long haul I would choose Wacha . He came up earlier in the year and was as raw as Carlos. He made three starts and won one of them. He spent time down in Memphis refining his changeup and working on his curveball. When he came back up and made a start in September, Wacha had transformed into a dynamic pitcher. Capable of pitching well in hostile environments and taking down great teams twice inside one week. That kind of improvement can’t be short changed. While Martinez was nasty, he showed a tendency to be wild and inconsistent. This happened every time he made a trip up & down I-55 and hopefully in the future he can work out the raw areas of his talent. However, there are no guarantees. When JD Drew and Colby Rasmus came up they were coined as the next Mickey Mantle. Martinez is sharp but needs innings and a defined role before he can become the next Pedro. Unlike Martinez, Wacha has a defined role and is already being groomed as Waino’s successor and a Cy Young candidate in a few years. He has taken Shelby Miller‘s spot with two months of pitching. That is based off opportunity and not skill set alone. As they say in sports you are only as good as what you’ve done in the show on the big stage. While we are talking futures here, I’d put my chips on Wacha side of the table. Any evidence can be taken from the opening trade rumor analysis. Wacha is seen as untouchable while Carlos is slightly expendable. You can’t find great young controllable pitching anywhere these days. Finally…if you have made it this far…MY ANSWER! I would have to go with Carlos Martinez. I fully realize and undoubtedly appreciate the incredible postseason performance that Wacha put together, but it is impossible to look past CMart’s incredible stuff. Martinez has three pitches–a four-seamer, a two-seamer/sinker, and a hard slurve. On average, all three pitches break over six inches horizontally–with his two-seamer averaging an incredible 9.6 inches of break–that’s over half the width of home plate! His four-seamer averaged 98 MPH and his two-seamer/sinker averaged 96 MPH this season. His slurve had a devastating drop-off in velocity, averaging just 82 MPH. Wacha has an incredible fastball-changeup combination, and he has the ability to develop an Adam Wainwright-like curveball, but I still feel like he is a lot closer to his “ceiling” than Baby Pedro. However, in my opinion, both are untouchables, and I look forward to seeing both pitch with the “Birds on the Bat” across their chest for years to come. This entry was posted in St. Louis Cardinals, United Cardinal Bloggers and tagged Carlos Martinez, CMart, Michael Wacha, St. Louis Cardinals, Wacha by stlcupofjoe. Bookmark the permalink. Hard question easy answer. There is no way to know! Assuming both stay healthy (CMart’s delivery prone to elbow injuries, Wacha’s to shoulder injuries), then Wacha will give you more innings in a season, and more innings per start. CMart is a prototypical K artist. His control has been his Achilles’s heal. Wouldn’t you know, working with Yadi, and Matheny giving him key spots in HUGE games has him attacking the zone as if his control was his greatest asset. He’s still a bit inconsistent, and his stuff has SO much break it’s hard to frame, and will always ALWAYS lead to a higher walk rate than Wacha. Both can be 9+ K/9 guys, CMart can K even more! That with his higher walk rate will mean less innings per 100 pitches. Less innings over a season for same work load. So inherently, Wacha gets the nod. I am sick of hearing Wacha is piqued too. The guy had an 18.00 K/9 in the minors in 2012 after his college season. If he has peaked, then whoopty doo, no one could TOUCH him in spring, or last year in the minors. That’s a good place to “peak”. Oh and by the way, he still is working on two other pitches (2 seem curve)… so how he is done devolving is beyond me. From there it’s all preference. What a horrible conundrum… NOT!